Greenpeace has stepped up its Save the Arctic campaign against Shell with a hard-hitting film depicting iconic landscape paintings burning up to reveal dystopian alternatives of the future caused by oil spills and drilling. A re-working of 'An Arctic Summer: Boring Through the Pack in Melville Bay' by William Bradford. The campaign group has teamed up with the creative agency Don’t Panic and British montage artists Kennardphillipps to create the two-minute feature. In a nod to George RR Martin’s Game Of Thrones book series, the film is entitled 'A Song of Oil, Ice and Fire'. In the film, ‘Pearblossom Highway’ by David Hockney, ‘Christina’s World’ by Andrew Wyeth and ‘An Arctic Summer: Boring Through the Pack in Melville Bay’ by William Bradford are consumed by flames to reveal the grim alternatives caused by oil spills and drilling. The campaign highlights Shell’s plans to begin exploratory drilling in the Arctic’s Chukchi Sea as early as July, assuming it can acquire the relevant permits, after President Obama gave the company permission earlier this year. Greenpeace said a movement of seven million people had already coalesced around its previous Save the Arctic campaigns and is standing by to take part in further protests against drilling for oil in the Arctic. The film has been uploaded to YouTube and Facebook’s new video platform and Greenpeace said it was using a team of ‘mobilisers’ worldwide for promotion on social media channels. The campaigners have targeted creative media outlets to build interest in the campaign before attempting to get coverage in mainstream media. However, a teaser shot of the artworks was sent to The Guardian ahead of today’s launch. Elena Polisano, Arctic campaigner at Greenpeace, said: "Shell could be risking disaster by drilling for oil in Arctic waters in less than six weeks. We made this video to expose that, and show how its plans affect all of us too – because the impact of climate change affects the places we all live in. All the evidence shows Shell can’t drill for oil safely in the Arctic. The extreme conditions mean it’s when, not if, a spill will happen. "Shell has a huge PR machine behind it, but it didn’t count on millions of ordinary people standing up to protect the Arctic. We need everyone to watch and share this video, to show Shell it won’t get away with destroying the world we love." Greenpeace said climate change was melting Arctic sea ice at "an alarming rate" and that March saw the "lowest sea ice maximum ever recorded" for the region. The receding ice makes it easier for oil companies to reach further into the region and extract the vast oil and gas reserves but harsh conditions, including floating icebergs and stormy seas, make offshore drilling a risky prospect that is likely to result in an oil spill, Greenpeace said. It quoted a report from the Obama administration that forecasts a 75 per cent chance of a spill during the lifetime of an oil well placed there. The campaign organisation referred to research that concluded Arctic drilling was incompatible with limiting global warming to no more than two degrees above pre-industrial levels, a target agreed by a majority of governments worldwide. 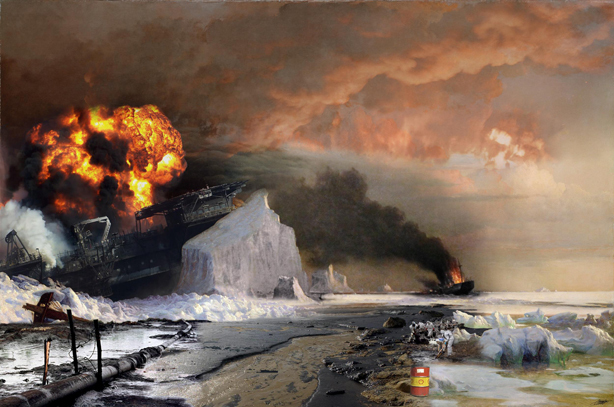 Kennardphillipps, the name of the duo of photomontage artists working on the campaign, said: "We sorted through hundreds of photos of oil accidents. We have superimposed these real oil spills on to the American dream and the pristine icebergs of the Arctic. "The poet Shelley wrote that as artists and writers, ‘we must imagine what we know’. We have tried to imagine through images what we know about oil exploitation. We must imagine what we know about Shell. We know that whatever the consequences to life, they are drilling for one thing – dollars." A Shell spokesman said: "We plan to drill in the Chukchi Sea in 2015 but, as we’ve consistently said, that plan is contingent on achieving the necessary permits, legal certainty and our own determination that we can carry out the exploration programme safely and responsibly. It is disappointing that Greenpeace chooses to focus on mounting publicity stunts rather than engage constructively in the debate about how to meet the world’s growing demand for energy while reducing CO2 emissions. The reality is that hydrocarbons will remain a major part of the world's energy system for many years, not least because they provide the path to prosperity for many millions of people in the developing world, enabling them to enjoy living standards that the western world takes for granted. Shell is actively engaged in developing solutions to the global energy challenge. We are pioneering Carbon Capture and Storage technology, calling for a robust global price on carbon, and producing more gas, the least CO2-intense hydrocarbon. We are working with many constructive NGOs and other organisations on these and other issues, in order both to raise the level of public understanding of the energy challenge and to ensure that the world moves towards a lower-carbon, higher energy future."